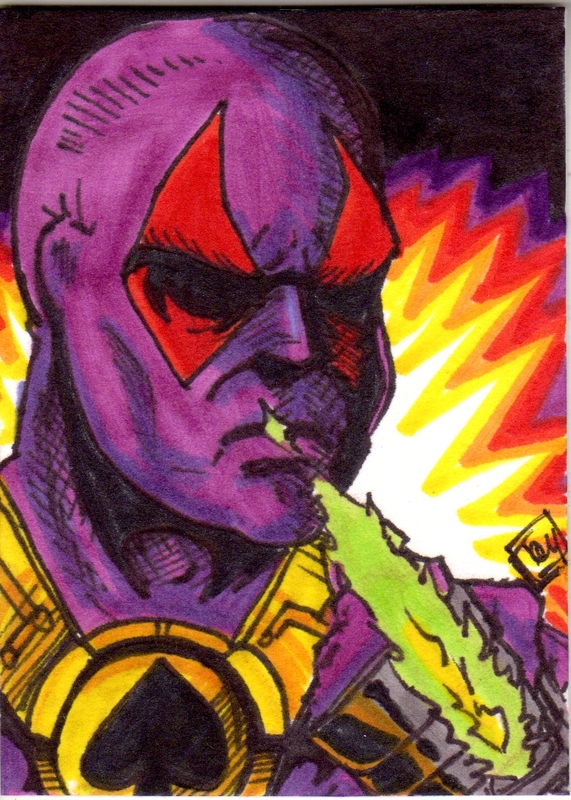 Taylor's Sweet Little Art and Nerd Site: Sketch Card of Day- The Mighty Spector! Today's deviation is The Mighty Spector! I think that this has to be one of the most controversial characters to come out as f here recent. For Mattel's Masters of the Universe 30th anniversary, they are making characters from past contest and, fan designs, sculptor designs, comic book writers designs, and Scott "Toy Guru" Neitlich, which is The Mighty Spector. I just want to get my own personal feelings out of the way before I continue any further. I really don't like the design, but I think he's an ok character having read the bio. For me, this character stands out like a sore thumb. A lot of MOTU fans complained about his mask mimicking Dead Pool from Marvel Comics. That doesn't bother me too much. What bothers me is the Spade on his armor. I just don't get it. Is he an ace in the hole? Does he play poker? Is it a military thing? I just don't get it. Other than that, he's ok in my opinion. It does make me wonder what all the fans are hating about, though. 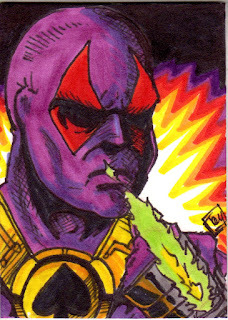 I wonder if it has anything to do with this being Scott Neitlich's design... You can also see this sketch card here.